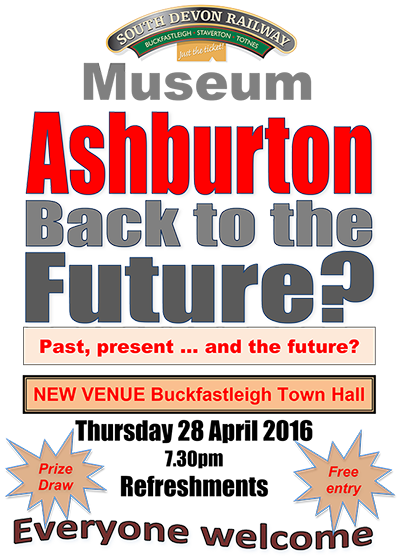 Just a quick reminder that this month’s SDRT Museum social evening will be held on Thursday 28th April at our new venue of Buckfastleigh Town Hall. Parking (free after 18.00) is available in Victoria Woodholme (where the buses turn round) and Mardle Way car parks. Entry is free, and there will be the usual prize draw and refreshments. The topic? – Ashburton. I’ll present an illustrated account of the railway from the very beginning to closure and the last trains in 1971, plus a bit about what it looks like today. There will then (hopefully) be some information about the possibility of getting trains back again, and if you think you can contribute then please come along. Check the Dartmoor National Park’s website and the Chuley Road masterplan for more info.